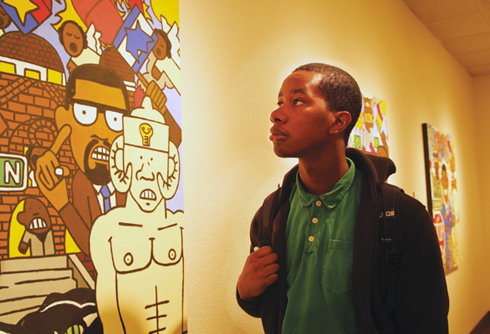 Public Relations major Jeremy Neal ponders Eric Humphrie’s painting “Bling-Bling King” April 4 during the VPAC art exhibit. Humphrie’s painting portays a six day riot that erupted in LA in 1992. 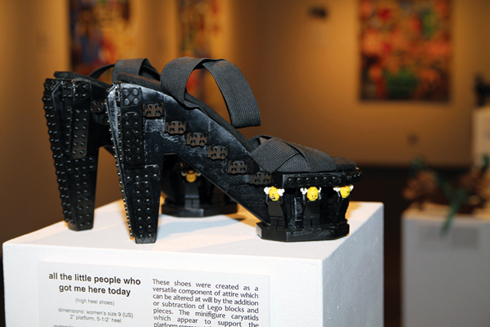 Local artist Hugh Meade showcases designer lego platform shoes in the VPAC art gallery April 4. The art show will continue through April 15. 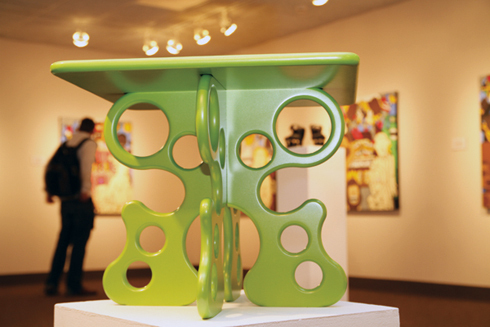 Artist Hugh Meade showcases a lime green side table consisting of three pieces that assembles in a couple of minutes by interlocking the two bottom pieces. The VPAC gallery show displayed designer shoes also made created by Meade. The show will remain through April 15 in the OCCC Art Gallery, located in the Visual and Arts Performing Center. The exhibit is free and open to the public from Monday through Friday from 11 a.m. to 7 pm. Meade, who creates furniture, calls himself an artifactor, a Latin word that means “thing maker.” Meade also exhibits shoes made of wood and Lego toys. Humphries said his purpose is to teach people. He said few people know about some of these events, such as the Tulsa Race Riot of 1921. 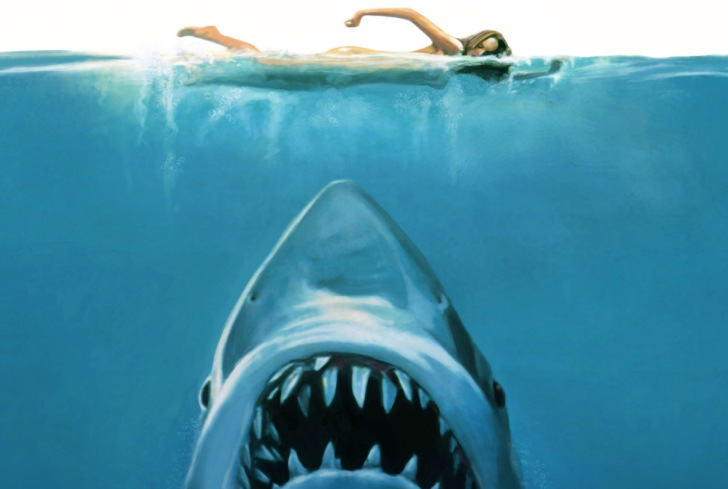 The Tulsa paintings, which measure about 3 feet by 4 feet, follow the story line frame by frame. “Is the Whole World on Fire?” is the group name for these pieces of art that tell the roughly 15 hours of the race riot event. In another instance “:03 Minutes in American History” portrays the time before, the time of, and the time after the Oklahoma bombing, which happened April 1995. OCCC student Sarah Smith said she thinks Humphries has an interesting way to approach history and to portray it. “I don’t particularly like the art itself, but I like what the artist has done with the history, incorporating it into his paintings the way he has,” she said. On the other hand, Meade said his art is oriented towards function, at least where his furniture is concerned. He said he wants viewers to see art being connected to the real world. One of his side tables consists of three pieces that can be assembled in a couple of minutes by first interlocking the two bottom pieces, then setting the tabletop in place. It has a manufactured, almost futuristic, look when unfinished. Meade has glazed the table in bright lime green with a silk-screened skull on top. “That art is a way of, it’s not just painting, it’s not just what we think of as traditional art, sometimes art can be expanded into a wider world,” Meade said. On the other hand, his hand crafted platform high heels fall more into the category of sculpture than footwear, though they are wearable. The Lego shoes, for instance, are four inches high and made of cherry hardwood to create the support. The Legos were incorporated into the heel and the platform sole, which consists of little Lego figures holding up the upper sole while standing on the lower sole. Meade said the Legos can be changed to create a different look. Smith said she was already familiar with Meade’s work before coming to the exhibit. To visit the artists online, go to oddfab.com for Meade’s work and www.paintedatrocities.com for Humphries’ work.